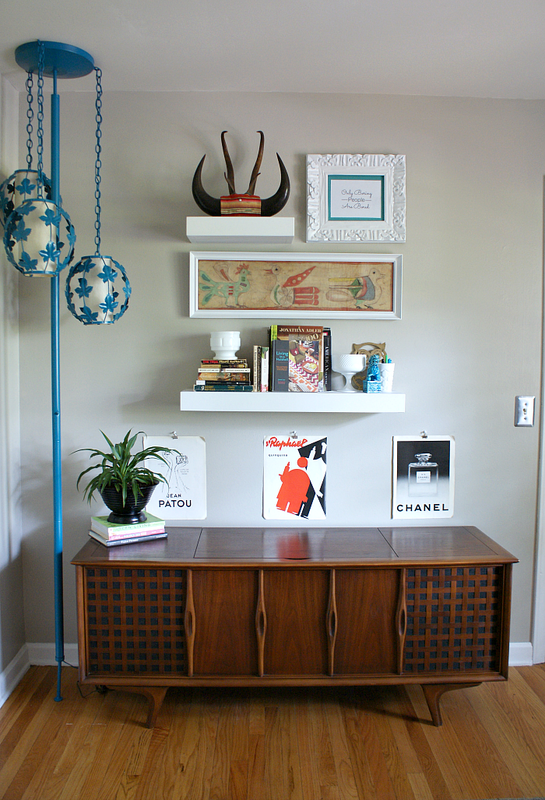 Our office is looking pretty snappy these days, mainly due to this amazing mid-century console my friend Megan scouted for me (thanks, Megan!). Unfortunately, the record player is on the fritz, but hey, I don't own any records anyways! Eventually I will get it repaired and start stealing my parents' vinyl, but for now I think I can buy an adapter so my iPod will play through the speakers. Maybe? Does that exist? 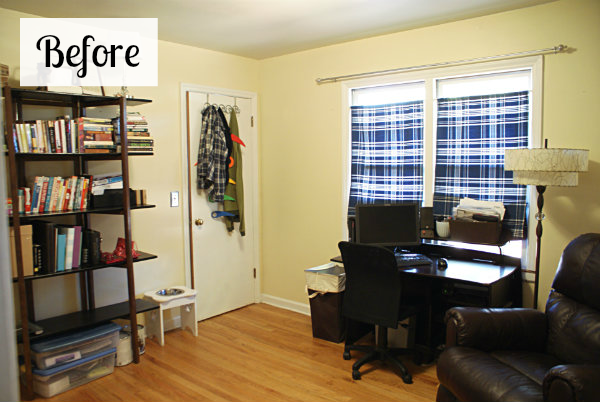 Below is how the office looked a couple of years ago; a yellow-beige mess of a room that was a catchall for junk and not very functional. Last year, I painted the room gray, organized the shelves and moved around some of the furniture. Those changes helped a lot, but it still didn't look and feel right. I would literally sit in here and stare, glass of wine in hand, just thinking and trying to find a solution for making the room "work" - and on a budget. The first and most annoying obstacle was a rat's nest of cords in the corner of the room that I needed to figure out how to hide. See that tangled mess in the corner below? Another issue was the desk. First, we had a "puzzle" desk that we bought when Jesse was still in school, but Juno chewed up one of the corners and it didn't fit with our style anyways. Then, I found this fabulous MCM desk and chair set (a ridiculously low priced Craig's list score), but it just isn't functional enough for us. The drawers don't have much storage space, and with Jesse using the closet in this room for his wardrobe, desk storage is a must. Also, the matching chair is pretty but uncomfortable. Bottom line, the set is more for a mid-century enthusiast who wants to simply admire it, not actually use it every day. The third part of the office challenge was figuring out where to (eventually) put a guest bed. I toyed around with various ideas; a queen sized bed, a sleeper sofa, making asking Jesse to build a custom desk and bed combo, etc. I've recently settled on a layout that includes a twin size bed, and I think this plan might stick. The record console wasn't part of the original plan, but it worked out perfectly. Jesse made a couple of floating shelves and I arranged odds and ends from around the house on the wall with it. I especially love the bird batik print I found at Junkstock this summer! 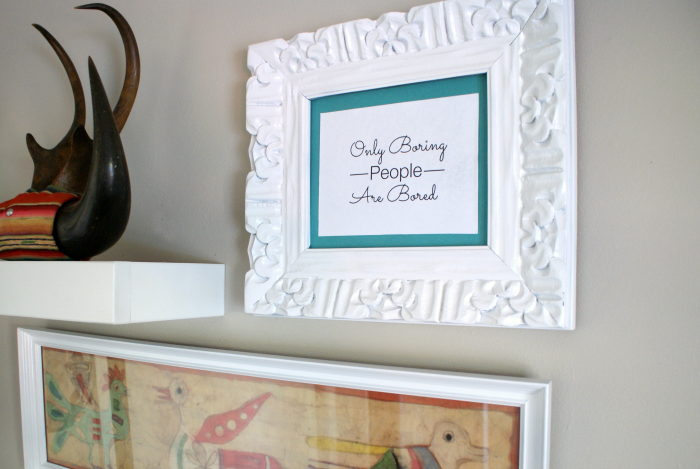 I also love the "Only Boring People are Bored" quote I made for the wall. Our family motto. I've had this tension pole lamp for years, it was recently in B's room and then stored in the basement. I spray painted it teal blue, but I can't decide if the color is amazing or horrible. It might get another coat of paint. This time in white. Because I paint everything white. Or black. I swapped the MCM desk for my sewing desk (a nifty expandable number I found at an estate sale wayyy back in college) and re-located it under the window. The is in rough shape, but it's too neat to paint, so I think Jesse and I might try to rehab the veneer this winter. I'm estimating the cost for a complete guest bed set-up to be roughly eight hundred to a thousand dollars, so we are pushing that off for a few months in order to put our funds into the basement remodel. I was going to put this slipper chair in the corner, but it was awkward and didn't do a good job of hiding all the cables and cords in the corner. I've had the ottoman since college, it's original upholstery is dark purple velvet with swirls. Classy. I think I've recovered it about six times, but for this round I just threw one of our Turkish bath towels over it. I made a tutorial for the house / heart string art a few weeks ago that you can see here. There is also a tutorial for the Ferm Living inspired potato stamp pillow, here. I'm working on tutorials for the other two pillows and hope to have those up soon! Do you have rooms you've struggled with in terms of layout? How did you find a solution? Keep in Touch by Following me on Bloglovin'!